NASA’s idea of a $3.46 billion-dollar drilling project be able to prevent the eruption of Yellowstone caldera remains unrealistic. Campi Flegrei, one of Europe’s supervolcanoes, is causing serious alarm due to the possibility of an eruption after a recent earthquake in Naples. After a dormancy of almost 500 years, the supervolcano has started to show signs of major unrest characterized by multiple earthquakes, heating, and accelerating deformation. Just last year, the Italian government raised the Campi Flegrei’s threat level from green to yellow after receiving a warning from a team of experts at the Italian National Institute of Geophysics of possible supervolcanic explosion. Yet, there’s another supervolcano that’s being closely monitored for any signs of extraordinary pressure build-up. 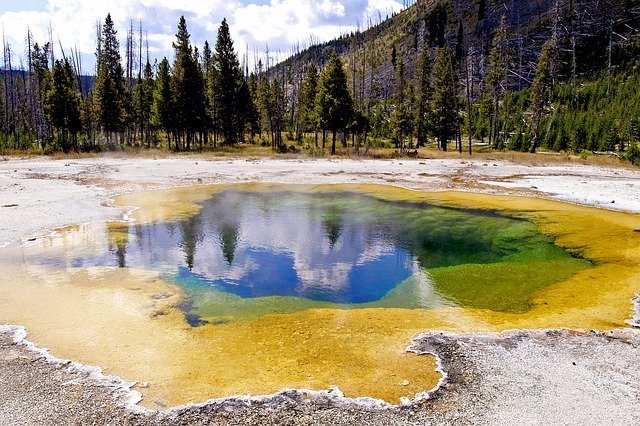 The United States Geological Survey (USGS) keeps a close watch on Yellowstone Caldera in Wyoming, which just like Campi Flegrei, is one of Earth’s most dangerous supervolcanoes. This year, Yellowstone Caldera has recorded more than 1,400 tremors since June. But the USGS said that there was no cause for alarm at the moment since the supervolcano experiences around 1,500-2,000 earthquakes on the average per year. What are supervolcanoes and how dangerous are they? Volcanoes are classified according to their “explosiveness,” which is measured based on the Volcano Explosivity Index (VEI) that was developed by Chris Newhall of the USGS and Steve Self of Open University in the United Kingdom. Qualitative descriptions of the eruption g. gentle, explosive, cataclysmic etc. Supervolcanoes have an eruption frequency of only once in every 100,000 years or more. However, this type of volcano has a maximum VEI number of 8 which means that its eruption produces more than 1,000 cubic kilometers of volcanic materials with the height of its plume reaching more than 25 kilometers. The least explosive volcano, Kileaua in Hawaii, produced only 1,000 cubic meters of ejecta with a plume height of less than 100 meters. An eruption of a supervolcano can create a “volcanic winter”. This condition is marked by the cooling of Earth’s surface due to deposition in the stratosphere of massive amounts of volcanic ash and sulfur aerosols. Its devastating effects include climate changes at the global scale for years after the volcanic eruption. Based on Earth’s history, one of the worst volcanic winters happened sometime between 71,000 and 74,000 years ago when Sumatra’s ancient supervolcano Mount Toba erupted. The explosion caused an ice age that almost wiped out modern human race. Yellowstone has a record of 3 massive eruptions in the last 3 million years. Its last eruption was 630,000 years ago which caused the formation of a 55 kilometer by 80 kilometer wide depression (caldera). But the supervolcano has also shared some blessings with the establishment of the Yellowstone National Park. Among the places that people enjoy at the park is the Old Faithful, a cone geyser that erupts at intervals ranging from 35 up to 125 minutes. Yet, the US government cannot overlook the possibility of a Yellowstone eruption. This is why the supervolcano is constantly monitored. Is there a way to prevent a cataclysmic eruption of the Yellowstone Caldera? The National Aeronautics and Space Administration (NASA) thinks that this is possible although the project may cost as much as $3.46 billion. NASA is proposing drilling into Yellowstone as far down as 10 kilometers. High-pressure water would then be pumped into the supervolcano to absorb the heat, then pumped out. The process would not only cool down Yellowstone Caldera, but it can also become a source of sustainable energy. “Through drilling in this way, it could be used to create a geothermal plant, which generates electric power at extremely competitive prices of around $0.10/kWh,” Brian Wilcox of NASA’s Jet Propulsion Laboratory at the California Institute of Technology explained to BBC. But, isn’t there a risk of actually triggering an eruption? There’s also a problem of how long it will take to drill down into Yellowstone supervolcano. At NASA’s estimated rate of 1 meter per year, drilling 10 kilometers down will take millenia. Moreover, NASA is uncertain if their theory will actually work. Nonetheless, NASA is hoping that by opening up this idea it would motivate other scientific agencies and individuals to discuss possible solutions to the real threats coming from the world’s supervolcanoes. Until now, all talk of any Yellowstone super eruption was that it could be the end of civilization as we know it and that there is nothing we can do about it. This story that we could actually prevent this possibility of incalculable loss is maybe the biggest news since we went to the moon! Finally something from the government worth celebrating! Hurrah! And super cheap electrical generation to boot! The wsp report of NASA’s estimate of 1 meter per year was in error. This meter per year from NASA was in reference to how fast the hot rock could be cooled, after the drilling and water pumping was up and running, not how fast the drilling could go! Big difference. Oops. Still, I love you lots wsp.